garment software for clothing, apparel, leather, footwear, bags, luggage, socks, hats, necktie industry manufacturing and factory in soft line products. Web remote access feature: maintain operation during outbreak since employee can work away from office individually. Risk management solution for your staffs and business. manage costing, quotation, sampling, development, fabrics, trims, purchasing, inventory, warehouse management, quality control, inspection, factory evaluation, production, sub-contract, shipping, export documentation, accounts and merchandising management. Trial logon username:demo password:123 require microsoft access 2007 runtime to run activation key required Starting from version 5.28 onward user is able to made their own change on the design. 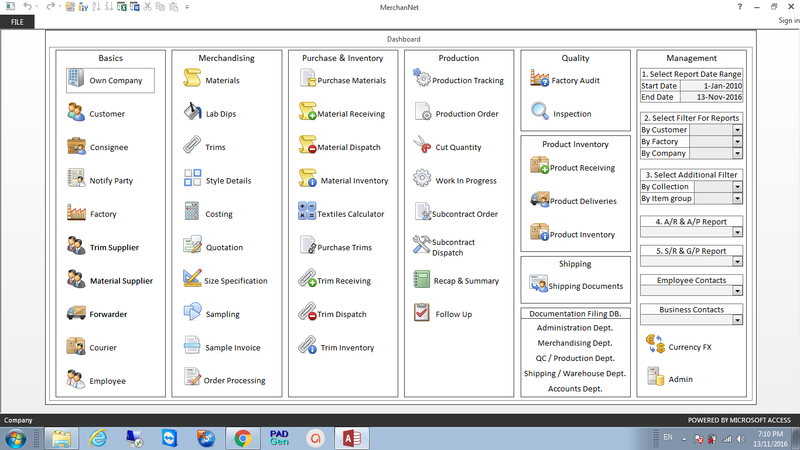 please click start > all program > MerchanNet - Design (shortcut) to open the software in design mode. however, user must have their own full version of MS Access 2007, 2010 in order to do so. In this case, user can simply change the design layout of all the report or input form format. Whatever field titles, field width, field length, position. may also go with any other MS Access software design.